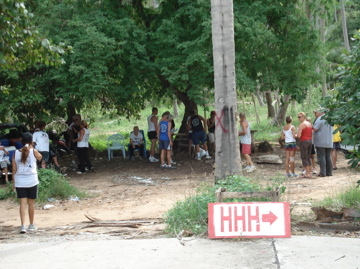 Every Saturday, the Koh Samui Hash House Harriers meet in the middle of the afternoon to run around in the jungle like maniacs looking for the right route, and afterwards gather around in a circle to drink beer out of coconut cups and talk a set of shite. You’d be amazed how much fun this can be! For those of you not familiar with the Hash, this is how it works. Every week two ‘Hares’ choose a location and set a trail, and they are the only ones who know where it goes. They also set a few false trails, so your job, as a participant, is to try to find the correct trail. The route is marked with shredded paper here and there to help you find your way. If you come across an ‘X’ with paper on it, whether it be made of coconut branches or whatnot, that means you’ve found a false trail and you must go back. You can sometimes hear Hashers screaming in the forest, ‘ON ON!’, which means that they’ve found the right way and you should follow them. The great thing about the Hash is you never know where the arse you are going, and the Hares usually like to throw in some interesting challenges for you. 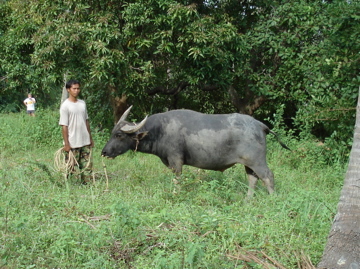 Yesterday we hashed in the bush on the south-east coast of Koh Samui, and ended up running through some farms, somebody’s back yard (they looked quite surprised at all these white people passing through their garden), and no Hash in Thailand would be complete without at least one buffalo. But you really never know where it will take you — you could go on the beach, through a river, up a mountain, under someone’s laundry line. That’s what makes it fun. Once everyone finishes and finds their way back to the Hash site, there are some top secret rituals which go on, often involving code names, wigs, buckets of ice and toilet seats, and the most crucial thing — beer. The motto of the Hash is ‘A Drinking Club with a Running Problem’, but it’s more than just an excuse to drink. It is largely a social gathering, and a nice chance to meet other people living here. The exercise is great, regardless of whether you walk or run. And you always get to see a new area that you otherwise never would have gone to. The beer at the end is just the bonus. 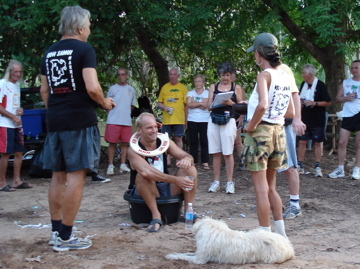 Anyways, there are Hashes all over the globe, including an excellent one in Trinidad, the Port of Spain Hash House Harriers. If you are curious, go check it out… you just might enjoy it. Just one tip for you: don’t ever wear a new pair of shoes. Trust me when I say you will regret it in more ways than one……..